Since 2013, when the state Department of Agriculture, Trade and Consumer Protection began to let some captive deer facilities with infected animals continue operating, additional cases of CWD have developed within those facilities, according to interviews and documents obtained under the state’s Open Records Law. After Gov. Scott Walker announced "aggressive new actions" against CWD, lawmakers rejected an emergency rule to limit hunters from moving deer carcasses from counties affected by the fatal brain disorder. "The existence of CWD in these facilities constitutes a clear, persistent and likely escalating risk to the integrity of the wild deer on the other side of the fence," Richards said. The new approach "is meant to mitigate risk of moving the disease ... outside of the fence," said Amy Horn-Delzer, veterinary program manager. "We don’t want to put any other breeding farms at risk," she said. 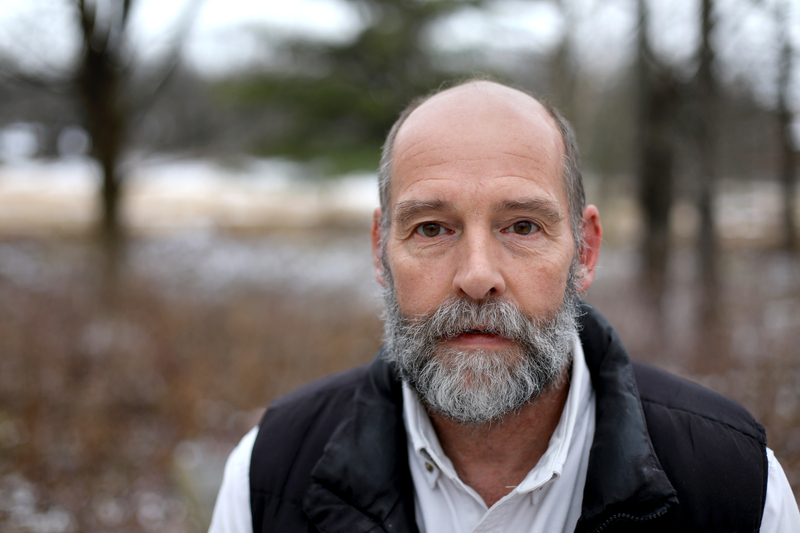 "We don’t want to put the wild deer population at risk. So, that’s the risk that we look at." "Since 2013, we have been looking at each of these (CWD) positive facilities on a case-by-case basis and just looking at risk," Konkle said. "In any of these cases in a positive CWD facility, they’re immediately quarantined as soon as we have confirmation of the disease," she said. "So, they are not allowed to move live animals on or off. So, there’s that method of control that’s put into place immediately." Despite having more positive cases than any other captive deer operation in Wisconsin, the ranch continues to sell hunts priced at between $4,000 and $9,000 each, with an option for a "Gold Hunt" — no price listed — that promises deer with antlers measuring 200 inches, including all points. DATCP’s quarantine policy change was celebrated by Whitetails of Wisconsin, WOW, the state’s deer farming lobby group. On Jan. 21, 2014, then-WOW president Shannon Thiex alerted members that their lobbying on the matter had paid off. "Last week we felt we had a case to fight to get the herds in this state reduced from herd quarantines to individual animal quarantines," wrote Thiex. "After some great teamwork on the quarantine issue we were notified today that DATCP would indeed be working this week to change these quarantines to individual animals only." "OK, we fenced in that property and we moved a bunch of these deer, we never took a deer from anywhere else other than this farm that’s never had a positive," Flees said. "We put them onto that property, and once they were on that landscape, for awhile all of a sudden we started getting some positives." "So that was a very interesting change in philosophy and quite different to what had been done previously across the rest of the country," he said. "We need to protect Wisconsin’s hunting traditions and long-standing heritage by working together to contain the spread of chronic wasting disease in deer," Walker said. "We are working on a companion permanent version of the CWD rule, and the goal is to have that rule in effect before or very close to when the emergency rule expires," Loomans wrote. "Yes, the longer period of time that people have to come into compliance, under the amendment, does make the timeline for the permanent rule more important." "Because I feel this is politically driven — not science or veterinary science driven — two years from now, if they don’t like it or CWD keeps spreading, they’re going to come up with something else that you have to do," Goetzka said. "They basically legislate you out of business." "So, it’s pretty clear that even a double fence does not constitute a complete barrier to the movement of an infectious agent with CWD," Richards said. "So, if that infectious agent can move from the outside into a captive facility across two fences, I see no reason to suspect that it could not move the other direction as well." "It’s a state issue," Horvath said. "They’re state entities. Yet, they’re each operating independently and acting like they’re only responsible for a certain part of it. They’re responsible to the citizens of the state for all of it. And if they can’t get together, if they can’t work with one another, they’re not going to work efficiently and get things done they need." “I think that someone’s profit potential — their individual profit potential — is not sufficient to jeopardize a tradition and an entire population of animals," Horvath said. "I just think it’s wrong." 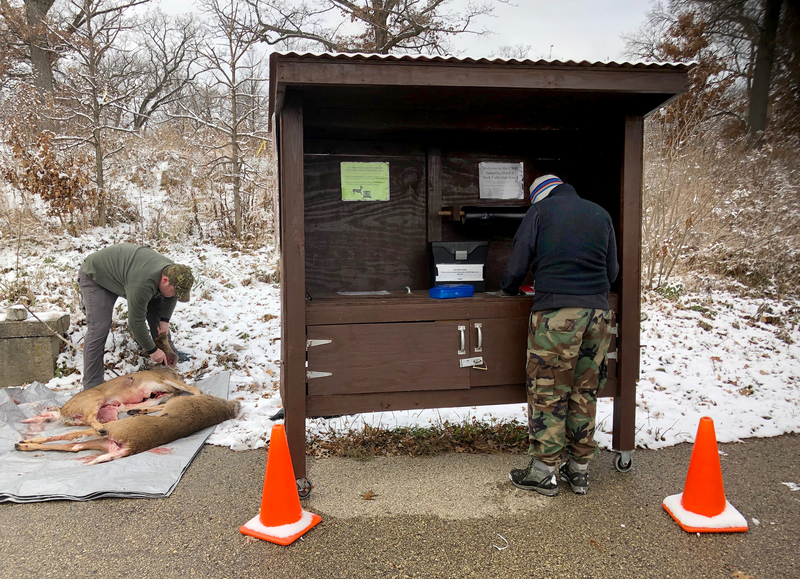 Hunter Paul Boehnlein of Madison was registering two deer for testing for CWD on Nov. 17, the first day of the gun-deer season, at the self-service station in Fitchburg, Wisconsin. 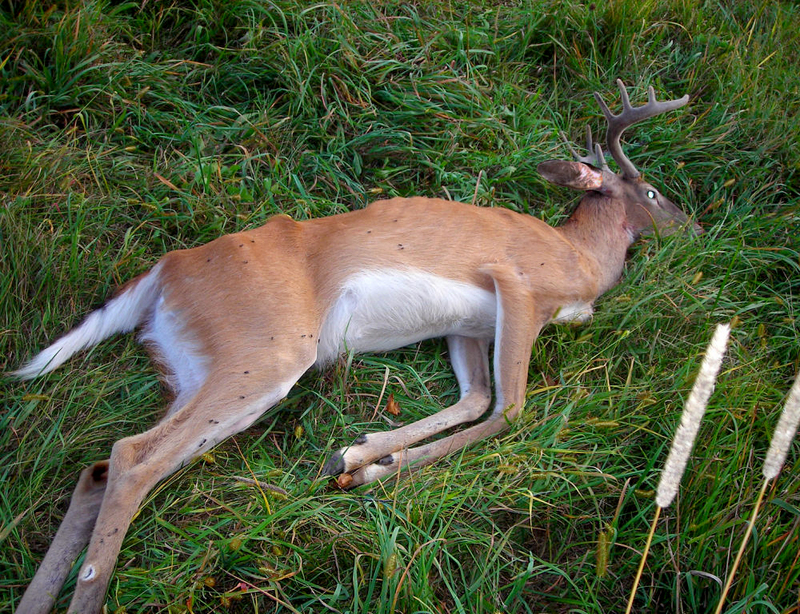 The young doe and buck were taken in Iowa County, which has been ground zero for CWD in the state. He favors double fencing for deer farms, adding, "I don’t really understand why people are farming deer in the first place." "Let us deer farmers do our work, and if we nail this resistance thing, let’s figure out how the state can maybe do the same thing in their herd." "We don’t know how the CWD prion proteins might change over time to influence both the infection and mortality of different genotypes and deer populations," according to an article co-written in June by Michael Samuel, an emeritus professor of wildlife ecology at the University of Wisconsin-Madison. 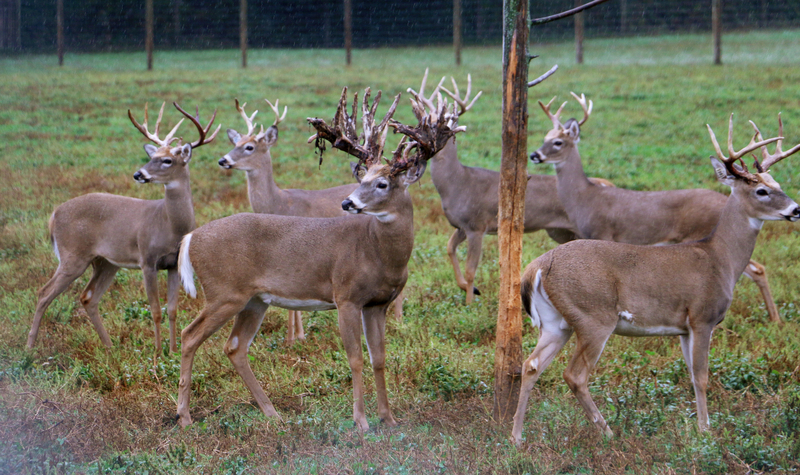 "There are still many unknowns that make clear predictions about the longer-term evolution of CWD resistance difficult." "I think the challenge with CWD is it’s been found both in the wild and on farms," said Konkle, the acting state veterinarian. "We don’t know which came first and, at this point, I’m not sure it necessarily matters. It’s a challenge for both our agencies that deal with farm-raised deer and wild deer to try to manage."